An organization reveals its personality by how it meets or misses deadlines. What I often see are two distinct personalities within a single organization. Call it organizational multiple personality disorder: leaders demonstrate a “Whatever it takes” mindset to meeting customer commitments, but less-than-reliable conduct with one another. How much of your time is spent fighting fires? 1. Expectations. Get input in advance from the people who will do the work to develop and agree to realistic deliverables and deadlines. Ensure roles, responsibilities and processes are clear. Does everyone on the team know what success and failure looks like? What’s the impact of success? Of failure? To the organization? To the individual? Do the people leading teams have the authority to make decisions and take action to achieve success? Make sure you’re measuring what matters and then make tracking visible for everyone—not just a chosen few. Agree on checkpoints through the life of a project then track progress so no one’s surprised at the end. 3. Review. Conducting quick but effective after-action meetings or post-mortem meetings can help teams develop systems to replicate successes and eliminate problems. How often do we assemble the team for a quick review of what worked well and what didn’t? When we lose a bid or a customer leaves us, do we find out the reason? How effectively do we convert ideas into action? How will you and your team perform during the last 90 days of the year? About the Author: Greg Bustin advises some of the world’s most admired companies and leaders, and he’s dedicated a career to working with CEOs and the leadership teams of hundreds of companies in a range of industries. He’s facilitated more than 200 strategic planning sessions, and he’s delivered more than 500 keynotes and workshops on five continents. 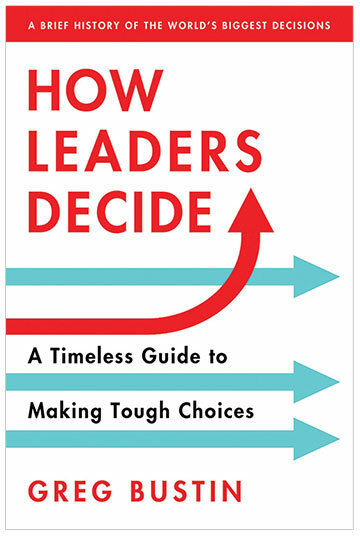 His fifth leadership book—How Leaders Decide: A Timeless Guide to Making Tough Choices—examines 52 of history’s greatest triumphs and tragedies and will be published in 2019 by Simple Truths.